Sri Lanka Cricket has appointed a special panel to review the findings of a report on Muttiah Muralitharan's bowling action. The spinner recently underwent tests in Australia after his action was queried by International Cricket Council match referee Chris Broad. "The report has come," SLC president Mohan de Silva confirmed. "Our bowling review committee should study the report first and make their observations to the ICC." 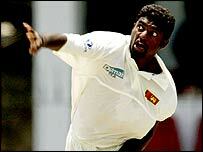 Muralitharan has taken 513 wickets in 88 Tests, six short of West Indies fast bowler Courtney Walsh's record. But the legality of his 'doosra', a ball which spins away from a right-handed batsman, remains in question ahead of their tour to Zimbabwe. The bowling review panel includes senior ICC match referee Ranjan Madugalle, selectors Lalith Kaluperuma and Roger Wijesuriya, former Test batsman Roshan Mahanama, bowling coach Champaka Ramanayake and former international umpire Kandiah Francis. They will study the report of University of Western Australia biomechanist Bruce Elliott, who supervised the tests in Perth. Muralitharan's action has been the source of controversy since he was no-balled for throwing by umpire Darrell Hair in a Test match at Melbourne in December 1995. The 31-year-old was later cleared by the ICC after a University of Western Australia biomechanical analysis, which concluded that the bent-arm action created an "optical illusion" of throwing.